"'You might end up dead' is my middle name." Of course, as with the other ZAZ films from Kentucky Fried Movie and Airplane! on, the plot is really just an excuse to pile on the puns, sight gags and non-sequiturs. These films have succeeded in large part because the jokes fly fast and furious—if one gag falls flat, it barely has time to register as a dud before another one steps up to try its luck. This one seems a little tired, as though constructed from recycled bits cut from the earlier Naked Gun scripts. But there are some wonderful set pieces, particularly an opening that parodies Eisenstein's Battleship Potemkin and a disco flashback that drags out the clichés and makes them work overtime. The humor depends rather heavily on sexual themes, and it's more topical than usual, dating the film to some degree. It's also an odd, bittersweet "time-warp" experience to see O.J. Simpson (as Drebin's fellow cop Nordberg) when he was still a respected celebrity. Leslie Nielsen's comic timing and mock-serious delivery are in fine form here (his more recent vehicles like Mr. Magoo pale in comparison) and the talented cast plays the most outlandish material completely straight in the time-honored ZAZ style. But there's a bit of a "going through the motions" feel to this third Naked Gun entry; the DVD commentary track implies that Nielsen, co-star George Kennedy (ill during shooting) and the production team were all tiring of the concept, and that weariness shows through here and there. Nevertheless, Naked Gun 33 1/3 is a fitting conclusion to the series, a fun film with a number of laugh-out-loud-in-spite-of-yourself gags, and its brief 82-minute running time passes quickly. Image Transfer Review: Paramount presents Naked Gun 33 1/3 in its original 1.85:1 theatrical aspect ratio with a fine anamorphic transfer. Colors are bright (slightly oversaturated for a cartoonish look) with fine detail and deep black level. The source print is clean, the digital transfer is superb and I can't imagine this 1994 comedy looking better than it does here. 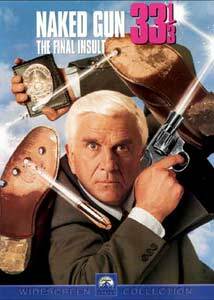 Audio Transfer Review: The Naked Gun 33 1/3: The Final Insult features a Dolby Digital 5.1 English soundtrack as well as English and French DD 2.0 Surround tracks. The 5.1 mix uses split surround effects on rare occasions, with the audio generally dominated by centered dialogue, some panning sound effects and an enveloping presentation of Ira Newborn's bombastic, hilariously overwrought score. There's a bit of LFE-level bass, but the audio is generally simple and straightforward. The 2.0 surround tracks are slightly less crisp, but both versions are cleanly mastered and support the visuals well. As with the other Naked Gun DVD releases, a group commentary track is provided, this time featuring producers David Zucker and Robert Weiss, director Peter Segal, and associate producer Michael Ewing. It's an entertaining track, with some insight into the production process, and it points out a few gags likely to be missed on a first viewing. The group occasionally becomes quiet, and one gets the impression that the filmmakers aren't particularly proud of some sequences in the film, but it's a valuable addition. The theatrical trailer is presented in a fine anamorphic 1.85:1 transfer with Dolby Digital 2.0 surround audio; it's entertaining, but it gives away too many of the gags, so watch it AFTER the main attraction. The Naked Gun 33 1/3: The Final Insult is a fitting end (for the time being) to this joke-a-minute series, perhaps the last of the old-style ZAZ films. It may not be to everyone's taste, but I dare anyone with a sense of humor not to chortle at SOMETHING here. Paramount's DVD is a class act, with an excellent transfer and a fun commentary track—recommended.